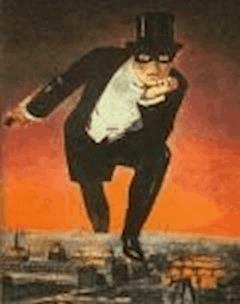 Fantômas was introduced a few years after Arsene Lupin, another well-known thief. But whereas Lupin draws the line at murder, Fantômas has no such qualms and is shown as a sociopath who enjoys killing in a sadistic fashion. He is totally ruthless, gives no mercy, and is loyal to none, not even his own children. He is a master of disguise, always appearing under an assumed identity, often that of a person whom he has murdered. Fantômas makes use of bizarre and improbable techniques in his crimes, such as plague-infested rats, giant snakes, and rooms that fill with sand.